The purpose of this attachment is to lift and lay temporary railway track, along Sod Peat ricks and milled peat piles. 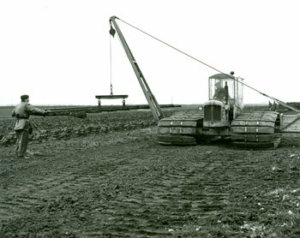 The attachment consists of an “A” frame jib pivoted on a bracket secured to the track frame of the tractor and braced back at the top by wire rope to projected ballast box on the other side of the tractor. The lift rope runs over a suspended single sheaf pulley block at the top of the jib and is fitted with a beam with ‘ice’ hook attachments to grip the rail sections. The lift rope is actuated by a hydraulic ram with pulleys at both ends to give multiple movement at the lift point. For Sod Peat operations a short jib is used and the brace rope is adjustable by winch, in consideration of overhead high tension electric system. For Milled Peat operations a longer jib with fixed brace rope is used.